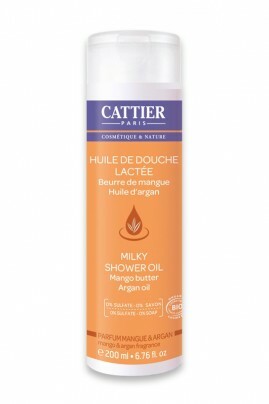 Soap-free and sulfate-free, Cattier's Organic Milky Shower Oil gently cleanses your skin in a pure relaxing moment. You will love its amazing texture which combines smooth milk to silky argan oil ! Its light and delicate foam leaves a protective layer on skin and exhales a delicious scent of mango. CATTIER Organic Shower Oil offers absolute comfort and softness to your skin while preserving its natural moisture. Soft and hydrated skin with this Milky Shower Oil ! Apply Cattier Organic Milky Shower Oil on wet skin, massage and rinse. For more generous foam, use with Konjac Body Sponge. Mango butter, Organic Sunflower Oil, Organic Argan Oil, Organic Macadamia Oil, Organic St-John's wort. 99% natural soap-free formula rich in organic ingredients !